When you want to order one or more products from us, it must happen through our webshop www.yoyo-world.com. You do that by finding the product or products you want to buy and add them to your cart by clicking the "add to cart" button available on each product's page. All products added to your cart will be available for you to see in the right side of the top banner. Once you have added all your products to your cart, you have to click on the "Go to Checkout" button. That will send you straight to the checkout process with an overview of your order. This is where you have to type in all of your informations such as your name, address, delivery method and so on. When you have filled out all of the required textfields, you have to click the green "Place order now" button in the bottom right. That sends you straight to the payment section, where you can choose your payment method and pay the order. As soon as your payment has been confirmed and completed we will be notified and send you an order confirmation. Your order will then be processed and dispatched the same day and you will ofcourse be notified when your order is sent. All prices on our webshop is including 25 % VAT (Danish). Shipping costs is determined by the weight of the order and where the order needs to be shipped to. We reserve all rights to make adjustments to our prices as well as adjusting our product descriptions, though it won't have any effect on previously sold items ofcourse. All payments of orders on Yoyo-World.com can be done by using either Visa debit/credit, Mastercard debit/credit and Paypal. Your payment will be withdrawn when your order is shipped. Should you regret your order and you want to cancel it, you can contact us at support@yoyoworld.dk or +45 29921313 as soon as possible. To ease the process please have your order number ready for us to identify your order. As we ship orders everyday at 4:00 PM CET we have to be notified about your cancellation before 3:00 PM CET. All orders below 100 EUR will be charged with the direct shipping cost depending on the weight of the order. Should you choose to buy for more than 100 EUR the shipping cost will be free of charge. All orders with a confirmed payment made before 4:00 PM CET (16:00 Danish time) will be processed and dispatched the same day if the products are available in stock. All orders will be shipped with PostNord Internationel Priority with an estimated shipping time of 3-7 workdays (excluding local custom process time). If you have ordered a product out of stock you will be personally notified within reasonable time with an estimate of the new shipping time. The shipping method does not offer tracking of the package. So if you have been waiting longer than the estimated 3-7 workdays, please do contact us at support@yoyoworld.dk or +45 29921313. If you want to return one or more items from your order, we offer the right to return your items within 24 months starting the day you recieve your order. Should you choose to return one or more items, the items has to be in the same condition and quantity as you recieved it. Meaning it has to be intact, sealed and therefor not used. If you however choose to return a used item, we will make an evaluatiion of how much the item has been devalued because of that and you will have the rest refunded. Please do enclose your order number and full name in the package return for us to speed up the process. All returnings has to be sent to the following address and should be marked "RETURN" to speed up the process time. 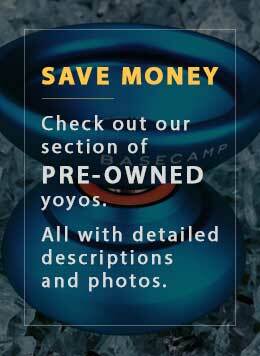 All expenses regarding the return of products is at your own cost, and not at YoyoWorld's cost. We, YoyoWorld, reserve the right not to be held responsible for any errors in pricing, out of stock items and changes regarding currency. From time to time we host giveaways on our social media profiles as a way of giving back to throwers for all the love and support we've got from the very beginning. None of our giveaways are hosted or sponsored by any other then ourselves, YoyoWorld. The rules of the giveaways and how to enter will always be stated in the social media giveaway post. It can be by commenting the giveaway post, answering a question, posting a photo or a video, etc. No purchase or payment is required to enter any of our giveaways, it is 100 % free. The prize(s) of the giveaway will always be stated in the social media giveaway post whether it is a gift voucher, a product or something else. In giveaways and contests where it is required to post a video or photo, we, YoyoWorld, will ultimately pick the winner. In all other giveaways the winner will be randomly chosen by Random.org. The odds of winning will depend on the number of entries. If there are 100 entries, the odds of winning is 1 %. All entries will be listed and given a number from 1 to x (total entries). The total number of entries will be typed in Random.org and there will be generated a random number in between. The random number will have a name in the list, and that is the winner of the giveaway.